What an invaluable experience NCECA 2017 was for us this March. It was truly a whirlwind week of wonderful interactions with artists, educators and collectors. Of particular value was the opportunity for the mentees to meet and get feedback from so many respected people in the field, ranging from established artists to instructors, and gallery owners. Thank you to all who came out to see what we do and view our exhibits. One more thanks to Jessica Jackson Hutchins and Ariel Brice for sharing their work in our exhibition space, and for Dan Anderson and Victoria Christen for all of the organizational work they put into Pots @ ASP. Finally, one last thank you to the Ash Street team for making it all shine. The Ash Street Project Emerging Artist Mentorship Program (ASP:EAMP) is now accepting applications for the 2017/18 mentorship year, which runs September 2017-July 2018. The mentorship program is non-traditional and organic in nature. In addition to what is stated on the website, we look for artists who are driven by a clear, attainable goal for their 11 months with us, and are relatively autonomous in their making. The success of the Ash Street Project is strongly rooted in community, and for that reason we consider what each applicant can contribute to our program. Our application process consists of two parts. First, please fill out an application form found on the website here. Next we will need to set up an interview. The interview is an essential component of the application process, allowing us to determine whether we are a good fit for you, and vice versa. The ideal is for the interview to take place on site at the Ash Street Project during NCECA next month, in order for you to see the site and meet with both Thomas and Joanna. If this is not possible, we will opt for a facetime interview. The Ash Street Project is grateful to be the host of Pots @ ASP, an exhibit and sale of pots by international and national artists, co-curated by Dan Anderson and Victoria Christen. Proceeds from sales of work to benefit the Tom Beardman Scholarship. Thank you Dan and Victoria! As co-curators for the exhibit “Pots@ASP” our goals were twofold. First, we wanted to promote one of the newest ceramic residency mentorship programs in the country, the Ash Street Project and secondly, we thought this would be a good way to publicly thank Joanna Bloom and Thomas Orr for their altruism as the owners and co-directors of the Ash Street Project. We selected a dozen ceramic artists whose pottery have both a singular uniqueness and possess high visibility on social media. Additionally, we were careful in our selection of artists to insure gender equity and a good mix of emerging, mid-career and mature ceramic artists. 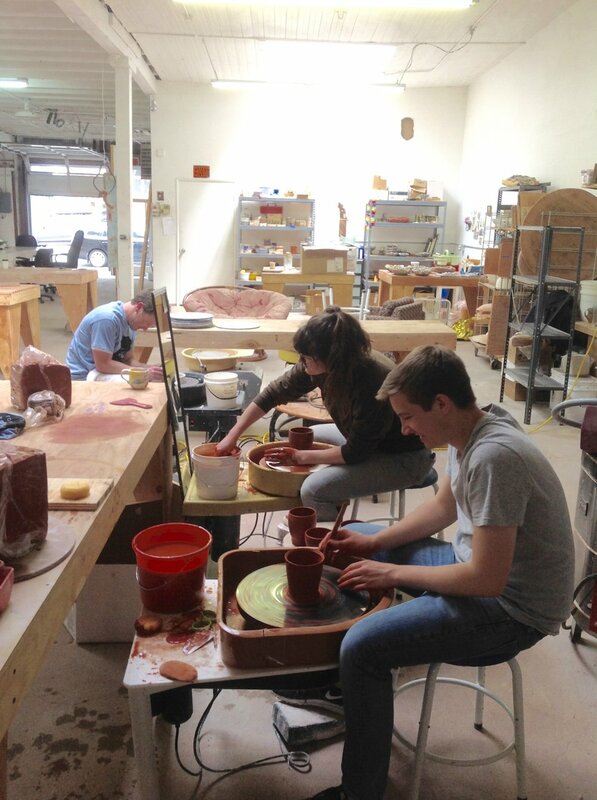 We hope you enjoy both the pots in the exhibit and this new Portland, Oregon venue for creating in clay. 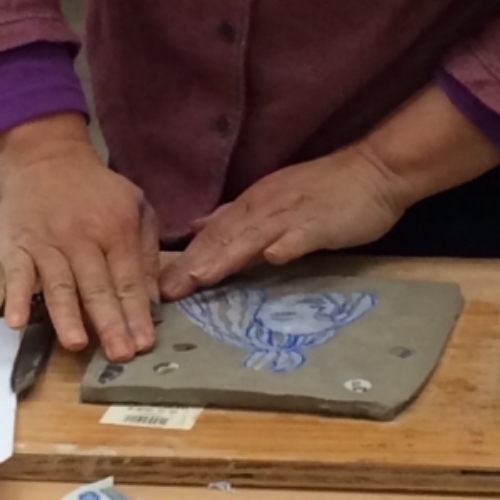 In case you haven't heard, NCECA (the National Council on Education for the Ceramic Arts) is coming to Portland in March, bringing nearly 6,000 ceramic artists and educators to the area, and filling galleries and local sites with ceramic art. The Ash Street Project is in the throws of preparation. Our artists will be involved in workshops and exhibits throughout the city, and we will host several exhibits on site as well. Below you will find a list of these events. Please click on highlighted names and sights to learn more about times and locations. Though you will need a conference pass for many of the events at the convention center, there are still a number of interesting opportunities that are free and open to the public. Link to the NCECA site and schedule also below. Please note that the Ash Street Project’s reception will be held from 6-9 on the Friday of conference week. A National Pottery Exhibit and Sale to Benefit the Tom Beardman Scholarship at ASP. Click here for more info. The Ash Street Project is honored to announce that Thomas has been named one of the recipients of the Regional Award of Excellence from the National Council on Education for the Ceramic Arts (NCECA). This award is in honor of his commitment to the field, both at the Oregon College of Art and Craft, where he retired Professor Emeritus, and at The Ash Street Project, where he has dedicated his retirement to mentoring emerging artists. It will be presented during the annual conference in March. Namita WIggers and Nicole Nathan, also award recipients, will be honored for their exceptional work with the Museum of Contemporary Craft. The award ceremony is free and open to the public. It will be held at the Oregon Convention Center in the Oregon Ballroom (203, Level 2) on Friday, March 24th, from 4:45-6:15 pm. Following the ceremony, we will return to the Ash Street Project for our Friday night opening reception to celebrate Thomas as well as all of the artists exhibiting on site. Please see following post for more details on ASP and our NCECA exhibits. A whirlwind three weeks have passed, from visiting artist Steve Colby's arrival, to his subsequent Winter Open House Exhibition. 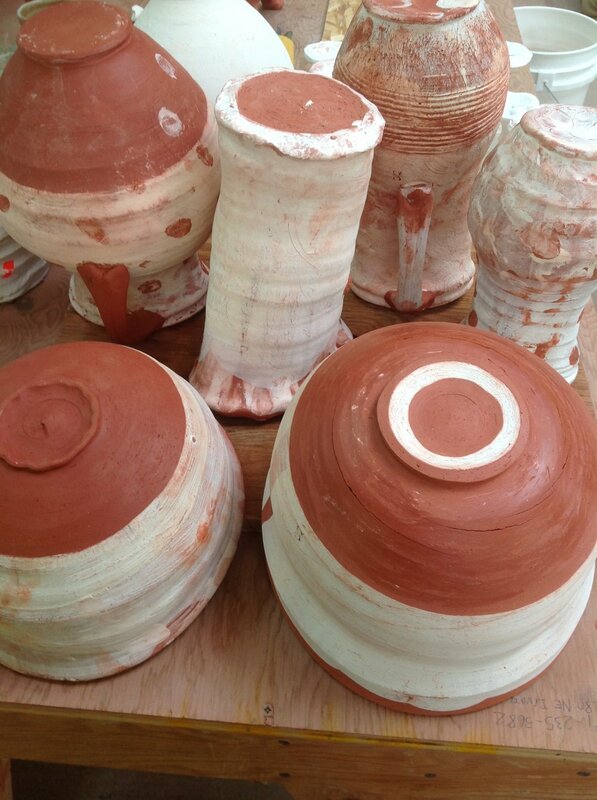 During this brief time, Steven created a body of work using the signature ASP red clay body and a variety of slips and glazes. It was particularly interesting to witness his application techniques, rendering some spectacular surface results with slips and tin glazes through brushwork, fingermarks, and such. On his last day with us, Steve cooked up a batch of his grandmother's Syrian lamb stew to share with the ASP community. Thank you Steven for sharing these few weeks with us! We look forward to seeing you at NCECA in March. The Ash Street Project community is excitedly awaiting the arrival of visiting artist Steve Colby ! Steve received his BFA from Alfred University in 1999. He has been artist in residence at Baltimore Clayworks, Arrowmont and Carbondale Clay Center. He is currently a member of SAW, studio for Arts and Works, in Carbondale Colorado. Steve shows nationally and is a working member of Artstream Nomadic Gallery. He will be working with us for the remainder of November, staying on to participate in our Winter Open House event on Saturday, December 3rd. Please see the visiting artist section of this website for more on Steve, and consider joining us for brown bag lunch or Winter Open House to welcome him to the Portland community. On Friday, November 11, from 4-6, the community is invited to view "Duc Pho" an installation by artist, Vietnam veteran and Ash Street Project co-director Thomas Orr. In addition, he will exhibit "War Tablets", a collaborative in-progress series between Thomas and Drew Cameron of Combat Paper. This work will be exhibited in the main studio space at ASP. Please join us during viewing hours for this special event. Ash Street Welcomes Matthew Asbill to the Mentorship Program! The Ash Street Project is pleased to introduce our newest member to the mentorship program: Matt Asbill. Matt is new to Portland, having recently lived in Jackson Hole, Wyoming and Brooklyn, New York. 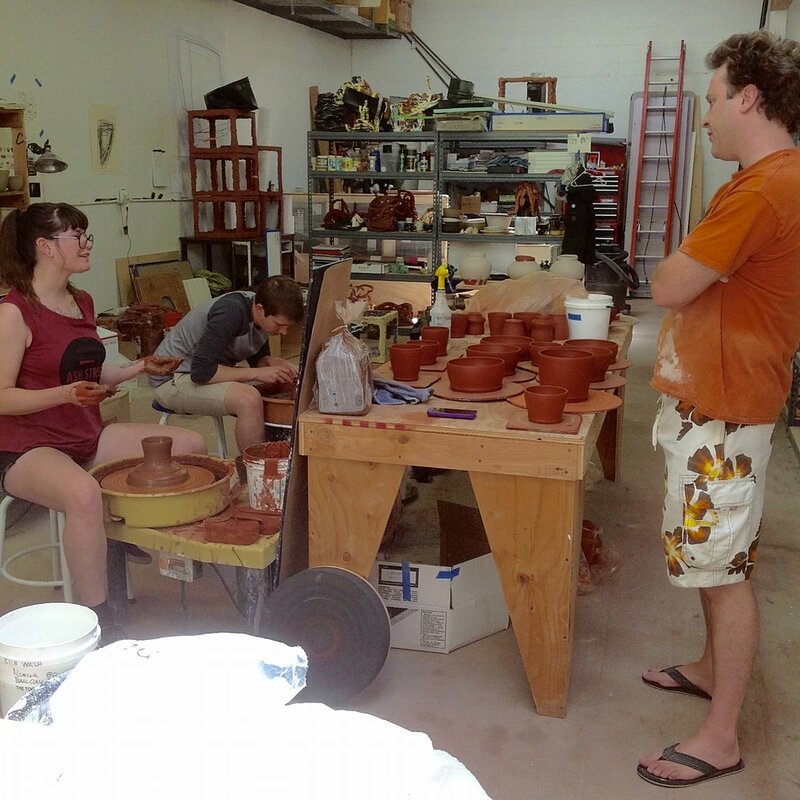 A graduate of University of Vermont, Matt found ceramics at the very end of his undergraduate career, and fell immediately for wheel work. He has since worked in art centers in Wyoming and New York and workshopped at both Penland and Anderson Ranch. Matt is very interested in working in a community of potters/artists, applying himself to focus his vision and pottery voice. Matt appeared an obvious fit to us immediately, and has already proven to be the perfect balance to our group. For more about Matt's background, please see the EAMP participants section of this site. The Ash Street Project, in conjunction with the Ray Grimm Legacy Project, is thrilled to be the host of Stirring Embers: Ray Grimm and a Life of Making. The Ray Grimm Legacy Project honors the life, work, influence and legacy of Raymond Grimm, a pioneer in the vibrant crafts movement in the Pacific Northwest through the second half of the twentieth century. The exhibition illuminates the connection between the ethos of today's makers and the life of the artist as modeled and lived by Ray Grimm. Grimm saw the connections between a caravanning bike trip to the coast and a recycled glass bottle, and taught his students to see the roots, branches and webs which connect makers and thinkers to the object. Curated by Nicole Nathan, Executive Director of the Arts Council of Lake Oswego and former Deputy Director and Curator of Collections at Museum of Contemporary Craft, Portland, the exhibition presents a collection of objects, images, drawings, and sketches produced by Grimm as well as those who he influenced--from former students Ginny Adelsheim and Dale Rawls to contemporary makers Lilith Rockett and Dana Lynn Louis. Nathan emphasizes that, "each of us can begin to glimpse the way Ray viewed the world and see he practiced what he preached. Instead of the individual object or person, idea or singular material, we see a layered and expansive and holistic ethos". Roundtable Conversation: Live Teaching moderated by curator Nicole Nathan with participating artists and educators Daniel Duford and Thomas Orr. For more information on the Ray Grimm Legacy Project, please click here. Artists participating in "The Intention of Color": Michelle Ross, Whitney Lowe, Thomas Orr, Joanna Bloom, Ben Skiba, Jimin Lee, Sarah Stokes. With a good deal of interest in glaze calculation in the studio, a conversation began around Birdie Boone's luscious use of color and her coaxial color blend. In her article "An Introduction to Color", Birdie touches on the intention of color as it relates to form in her work. This idea inspired the idea of a conversation topic. The Intention of Color proved to be a complex topic to undertake! 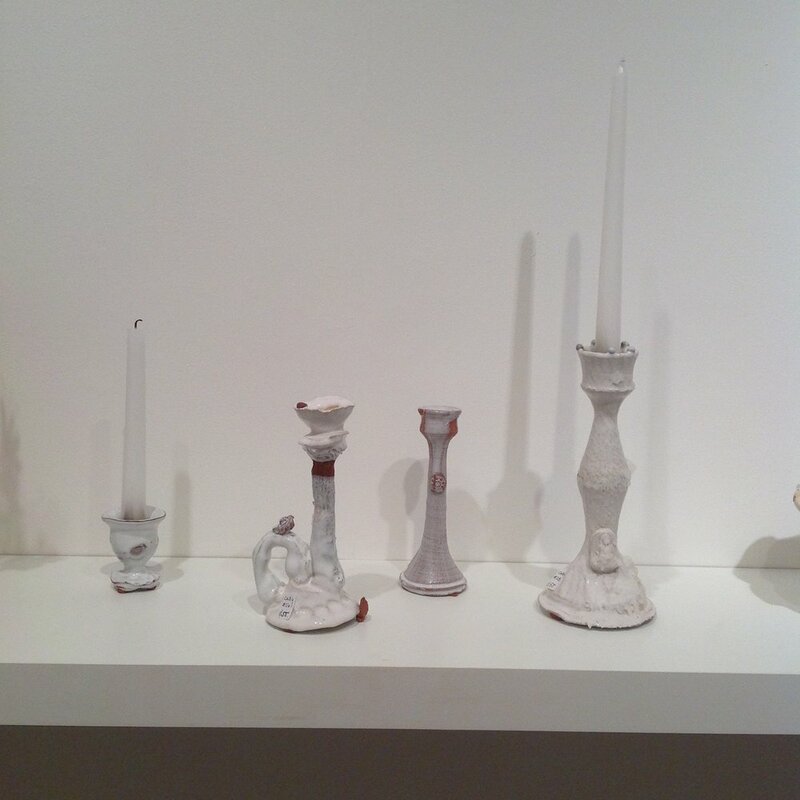 Color as underglaze, married to the object through fire, as opposed to color in painting, seen as more of a skin, was one of the many complexities the discussion touched upon. It's possible we all left with more questions than answers. Following our discussion, our invited artists walked through the Entrance show with the mentees for an open discussion about their work. Thank you to our guests, Michelle and Whitney, for sharing your insights with us. The Ash Street Project is pleased to introduce Adrienne Eliades. New to the greater Portland area, Adrienne will be working at ASP through the end of December as a visiting artist. 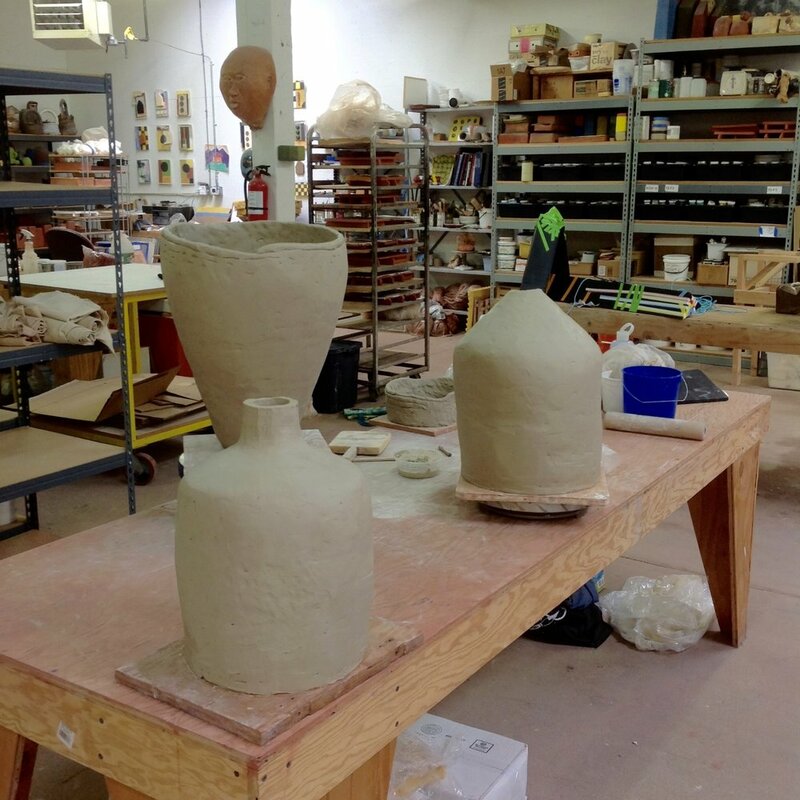 Adrienne recently received her MFA in Ceramics from the University of Florida. Exhibited nationally, Adrienne’s work, is propelled by her research of 20th century domestic spaces, while striving to reinvent mid-century patterns and construct social dining experiences. For more on Adrienne and her work, please see the visiting artist section of this website. The Ash Street Project Entrance Exhibition provides an opportunity to view the work that the our incoming artists are making prior to the start of the mentorship program. It is with great enthusiasm that we embark on this new year with mentees Jimin Lee and Sarah Stokes, as well as returning studio assistant Ben Skiba! We have so much in store. It was truly a celebratory evening for us, with many new faces in the house! This slide show of over a dozen images from Summer Session 2016 provides a brief recap of the industrious and celebratory two weeks we spent with our invited artists this summer at the Ash Street Project. Summer Session allows approximately half a dozen invited artists two weeks of exploring ideas amongst peers, our mentees and the community. The 2016 session was extremely productive as well as great fun. Per usual, the mentees took turns as hosts to our guest artists, which at times became a bit outlandish and downright competitive. The session closed with the annual presentation of the Hostie awards, created by our invited artists and presented to the mentees. We are so grateful for this summer's artists and all that they brought to the session! Please refer back to the June Summer Session post on this site for links to our guest artists' websites. It is hard to believe that we are headed into the fall and a new cycle at the Ash Street Project already! A catchup is long overdue on some of the major events of this past spring! May and June at ASP saw the consecutive exit exhibits of all four 2015/16 mentorship participants. It was bittersweet to say the least. These events were accompanied by exit talks, all of which illuminated how much these four had achieved in their short 11 months with us. Though they all hold so much promise, they have become like family to us, and it will be hard to see them go. For now, they will all remain in Portland. In brief, here is what is next for each of them, as well as links to where you can find their work. Please click on each name below for a link to the artist's website. Ivan Carmona having developed a new, more personal body of sculptural work at Ash Street Project, Ivan is headed to Thurman Street Studios in northwest Portland to continue his practice. Ivan will also continue teaching at Oregon College of Art and Craft. Ben Skiba explored his ideas through a variety of media this year at Ash Street Project. His exit show involved his explorations in both 2 and 3 dimensional work. Ben will be staying on at Ash Street Project as our studio assistant, while continuing his studio practice and working at Mudshark. Aleka Tomlinson focused her time at Ash Street Project on developing a line of pottery, as well as an website and on-line shop. 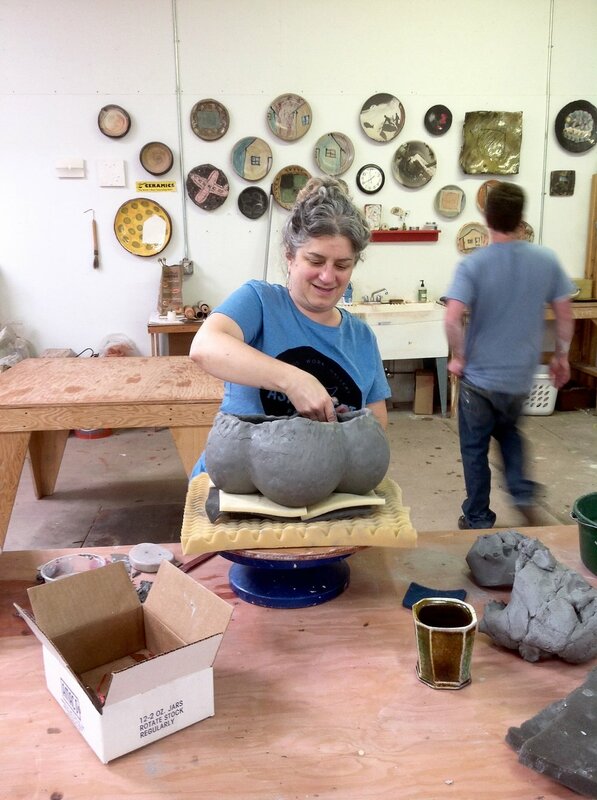 She is headed to Penland to assist potter Birdie Boone for the early fall, and then will return to work in her newly created studio in southeast Portland. Jordan Pieper shifted his focus, over the course of his time with us, from making to curation. His exit show acted as his curatorial debut. Jordan will stay on part time at Ash Street Project as Gallery Assistant, where he will oversee the gallery's involvement in the Ray Grimm Legacy Project in November and multiple exhibits during NCECA in March of 2017. In the remaining months, he will curate several exhibits of his own design. Jordan has set up a studio in northeast Portland, and will continue to teach at Oregon College of Art and Craft. Please watch these artists' websites and social media pages (as well as ours) for their news and events. All of our past participants will be invited to participate in our Winter Open House event, scheduled for Friday, December 2nd. Please mark your calendars, details to follow. The Ash Street Project is pleased to announce our 2016 Summer Session Line Up! Summer Session was created in an effort to shift the studio environment with the season's inherently different pace and rhythm. Each summer, we invite six artists to come join us for a two week period. This is an open time for them to discuss, create, and share in an exchange with each other, our studio community and the community at large. This summer, from July 11-22nd, we are pleased to host the artists listed below. Please click on each name for more information. Feel free to join us for brown bag lunches (12-1, M-F) during these two weeks, as well as an opening cup exhibit Tuesday, July 12 from 6-8pm. 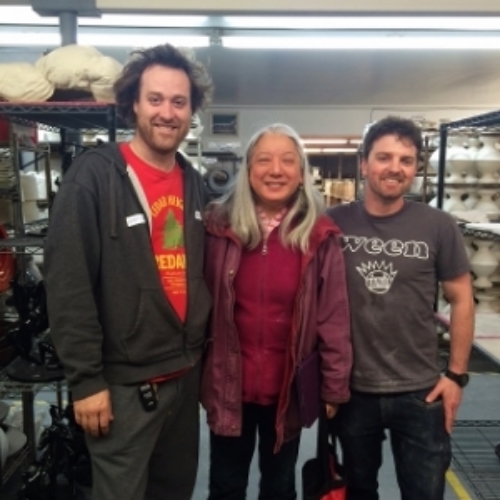 It was a whirlwind two weeks with our spring visiting artist Eva Kwong. 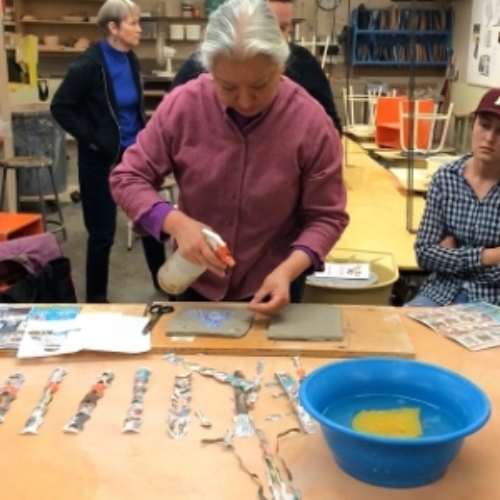 While in the studio at the Ash Street Project, Eva made a series of new sculptural vessels, and talked with the mentees about mixing slips and surface application techniques. Along with this, Eva managed to visit several area colleges, the OCAC fab lab and the Mudshark slipcast manufactory. We look forward to Eva's return to Portland for NCECA in March. (Note: please click on images if slideshow is not automatically turning). During the months of May and June, Ash Street Project will be exhibiting work from the 2015/16 mentorship program. These four consecutive exit exhibits are the culmination of the artists' experiences here at Ash Street Project. Each artist is solely responsible for all components of their exhibition. Artist receptions will be held on Fridays from 6-9pm. Gallery hours and dates for each show are listed below. Artists participating in the discussion of "Historical and Cultural Appropriation": Jordan Pieper, Thomas Orr, Aleka Tomlinson, Rowland Ricketts, Ben Skiba, Joanna Bloom (not pictured), Ivan Carmona, Eva Kwong, Namita Wiggers. With so much recent media attention being given to the subject of appropriation, we decided to address the topic, at our recent conversation, as it relates to history and culture in craft. Our discussion made several circles back to the topic of contemporary authorship. The metaphor of genetic modification was proposed as an example of how our culture's quick need for profit (or authorship) allows ideas to be transformed without first being fully "digested". Other perspectives challenged were the idea of "tradition", the questioning of what is culture, and how we define it, and the need for multiple critical views about craft, rather than a master narrative. 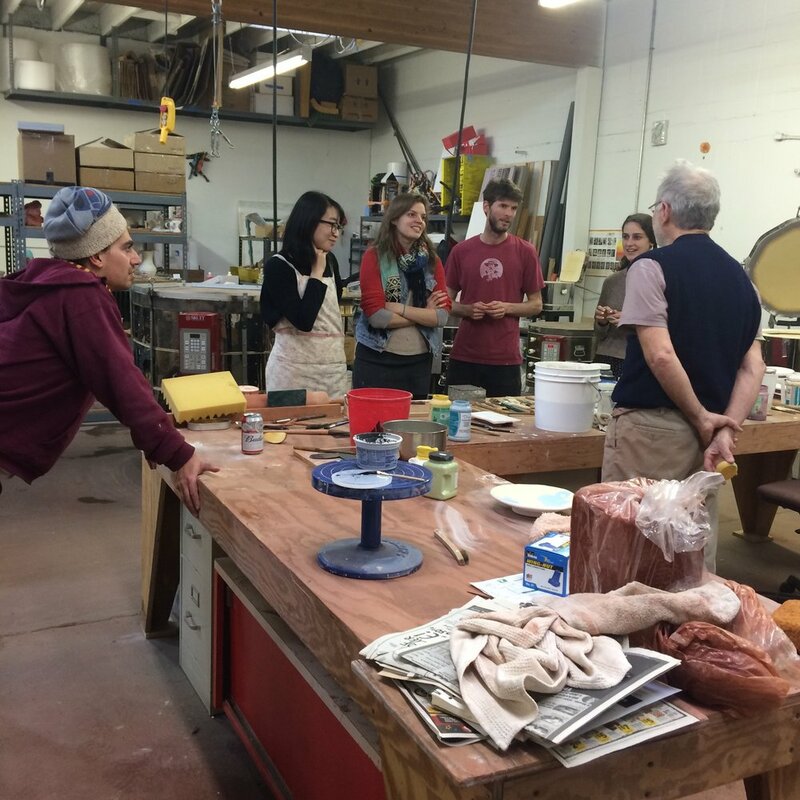 Ash Street Project is pleased to host a lecture and demo with potter Josh DeWeese. Artist Talk: Wednesday, June 1, 7:00pm (doors at 6:30). Ash Street Project will be hosting a special two part lecture with Josh DeWeese and ASP mentee Ben Skiba. Josh's exhibit will open at Eutectic and Ben's at The Gallery at Ash Street Project, both on the evening of Friday, June 3. A Day with Josh: Saturday, June 4, 10-4. In conjunction with his talk and exhibit, Josh will be offering a full day of demonstration, discussion and sharing of stories at the Ash Street Project studio. Limited to 30 participants, $25. To secure your spot, please email your name and contact information to info@ashstreetproject.com. An information packet with details will be sent digitally upon receipt. Artist Receptions: These events are in conjunction with the opening of Josh's exhibit at Eutectic Gallery and Ben's exhibit at The Gallery at Ash Street Project, which open concurrently on Friday, June 3rd.